If you think everyone else is rainbows and lollypops through and through and you’re the only one who has dark ugly spots – you are dead wrong. For years I tried so hard to appear perfect externally, but internally felt so empty and misunderstood. Because I wasn’t showing my true self, I was showing the person I thought other people wanted me to be. I judged myself very harshly and of course karmically chose to incarnate into a highly critical family to embed and uphold this pattern for me, yay….. But how does this all relate to the weird picture at the top of this post? Well, as many of you are aware, I’m completely obsessed and in love with making orgonite everything right now. My latest pieces are pendants, and it was this above pictured recent FAIL that helped me understand self love better. 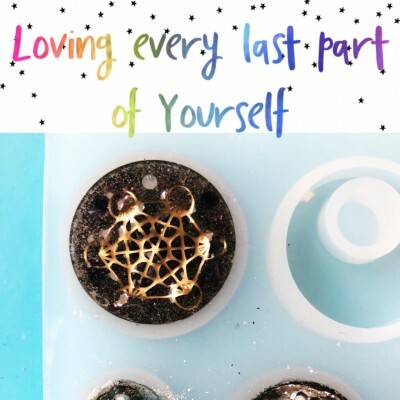 You see, the pendant in the picture above turned out tragically… It’s all bumpy, mis-shapen, and worst of all – it will not come out of the mold. Try and pry and yank as I might, it is not going anywhere. It’s going to be a part of that mold forever. I have to see it and acknowledge it every time I make more pendants. And if we’re completely honest with ourselves – our bumpy mis-shapen aspects aren’t going anywhere either. But to show them to others – gasp – unthinkable! Death! Dying! Horribleness! It’s true. There is a part of our brains that is wired to make us want to fit in. I believe this all stems from a primal survival instinct, a very real fear that if we don’t fit in the with the tribe we will be ostracized and literally left by ourselves to die. Obviously this is no longer a real and present danger. We no longer depend on our tribes in such an extreme way. But does our lizard brain know this? Nope. So we need to re-wire that part of our brains, and the sooner the better. This is all part of the giant and complete move from fear to love. From fearing being vulnerable to loving every part of ourselves and being able to show and embrace them. A very simple activity you can do whenever you notice self criticism pop up is to say to yourself, “I love and accept _____ (whatever you were criticizing)”. This requires repetition, patience, and determination. Another activity I love is facing the fear head on. Set the intention to reveal one of the pieces of yourself that you currently judge about yourself to someone close to you. Sometimes we have big subconscious blocks to loving ourselves and we’re stuck in some pretty deep patterns that have us rolling in misery. Getting off this hamster wheel of doom can require the help of someone outside yourself, someone objective, someone with the skills to identify and clear those absolutely annoying patterns. Someone like me! Definitely do work with the above activities to re-pattern your thinking so you can love every piece of yourself. Then if you still find there are areas you just can’t seem to budge, connect with me. We can talk about what transformation is possible for you. Let’s get back to my pendant mess now. By sharing publicly my embarrassing mess of a pendant fail, I’m fully admitting and showing that I am not perfect. I don’t get things right 100% of the time. Would I have done this 10 years ago? No way. But I can do it now. So what if I made a crappy pendant, that doesn’t change the amazing Divine eternal being I am. My wish for you is that you become fully ok with and love every last part of you. Because you are a beautiful Divine eternal being. Twyla K is the owner of Soul Shine Healing & Coaching. She offers Clarity Sessions to help people uncover what’s blocking them, what they truly want and what they can do about it. Click Here to apply for a Clarity Session today!